A rich source of organic iodine (and other trace minerals) needed by both over- and under-active thyroid glands. From Nature's Sunshine - NSP - Kelp and watercress - natural iodine sources. THYROID ACTIVATOR has been used when there is enlargement of the thyroid, prostate, lymph and other glands. From Nature's Sunshine - NSP - Support the thyroid gland. Enhances the production of the thyroid hormones, which regulate oxygen use, basal metabolic rate, cellular metabolism, growth and development and body temperature. Thyroid iodine combination from Stan Malstrom. Target TS II also contains targeted minerals and amino acids. 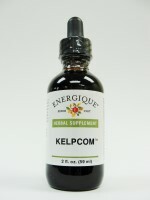 From Nature's Sunshine - High-mineral seaweed that regulates metabolism. Iodine is important for thyroid disorders (both overactive and under-active) and obesity. Fortifier for the thyroid gland.